A challenge of historical theater, regardless of the accuracy of the events portrayed in the play, is to balance the accounting of the past with the all-important action of the present. 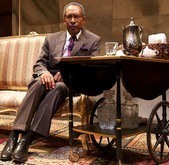 In Breakfast With Mugabe, written in 2005 and currently being performed for the first time in New York at the Pershing Square Signature Center, part of this balance is in the representation of Robert Mugabe, the notorious longtime president of Zimbabwe. Is he best demonized as the type of undemocratic tyrant we commonly see in media representation? Or is the play better-served by humanizing him so that an audience can attempt to empathize with such a difficult character? Between Fraser Grace's surprising script and David Shookhoff's nuanced direction, the answer is not a simple one. In Breakfast. . . President Mugabe (played deftly by Michael Rogers) is a haunted man, plagued by visions of a ngozi, the apparitional appearance of one of the deceased. In the President's case, it's the ghost of a man he fought with in the struggle for the independence of Zimbabwe — a man who happened to have lost his life around the time Mugabe was estranged from his beloved, dying first wife. The fact that this premise rings of Shakespeare is not dulled down by the surrounding players. The President is urged by his second wife, the dubiously named Grace, to consult a psychiatrist in order to quell the ngozi spell. Grace, while at first seemingly well-intentioned, is a reflection of Lady Macbeth's cold manipulation by the end of the play. But Mugabe doesn't mirror his Shakespearean counterpart in the same way. Macbeth ignores the warning signs his apparitions present, and his ignorance contributes to his downfall. Mugabe confronts his ghosts and uses the confrontation to further dominate those around him, including the white psychiatrist assigned to help him.